Following in footsteps of the best selling kids worship series, I Could Sing of Your Love Forever and Here I Am To Worship, Worship Together returns with a new collection of modern worship favorites sung by kids for kids! 10,000 Reasons Kids Worship includes songs made popular by artists like Chris Tomlin, Hillsong, Matt Redman and many others. Features 7 of the top 10 songs sung in churches today (according to CCLI). Geared for kids ages 6-10, 10,000 Reasons Kids Worship features kids singing the worship songs they love in a tone that even Mum and Dad can enjoy. 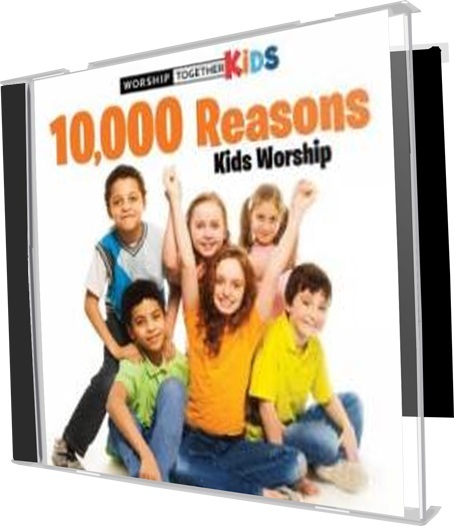 10,000 Reasons Kids Worship CD by Worship Together Kids was published by Integrity in April 2014 and is our 5627th best seller. The ISBN for 10,000 Reasons Kids Worship CD is 0602537687039. Be the first to review 10,000 Reasons Kids Worship CD! Got a question? No problem! Just click here to ask us about 10,000 Reasons Kids Worship CD. Now Playing: One Thing Remains Your browser does not support the audio element.